IMF Printing Cylinder Repairs endeavours to provide you with a special on-site service, available to your business 24 hours a day, 7 days a week. This enables us to monitor your machinery around the clock 365 days of the year. We provide each client with a specialised team of highly qualified engineers, who can tailor your individual requirements to cover a wide range of complex requests for repairs. The repairs undertaken are extensive and include low areas due to sheet jams, Allen key damage (nuts, bolts) and most common of all the break-up of damper bearings. All work undertaken is given a lifetime guarantee to the print quality of the repairs! IMF also carry out on-site welding of cylinders e.g. pieces broken from the main body of a cylinder can be welded back, ground down and electroplated back to size. This repair is then cosmetically finished giving an as new appearance. 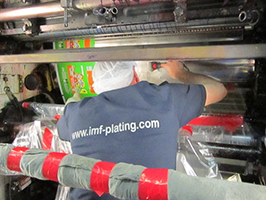 Whatever the nature of the repair, IMF Printing Cylinder Repairs have skilled staff and are able to offer reliable and cost effective solutions to all of our customer’s needs.